Most dogs will look for food at least twice a day. However, given the busy work and school schedule of people nowadays, sometimes you forget to feed them. Everything’s just for canine nowadays. 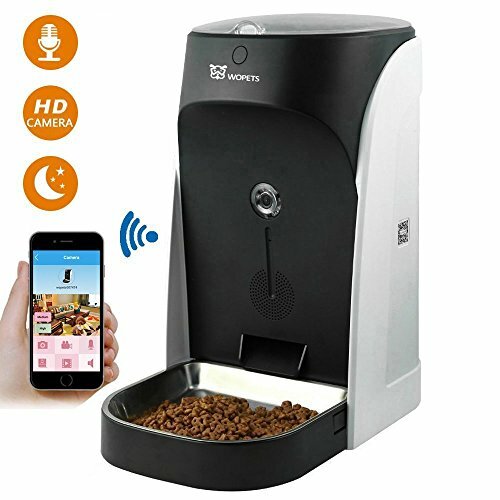 From luxury bed to pet monitor and now, an automatic pet feeder! 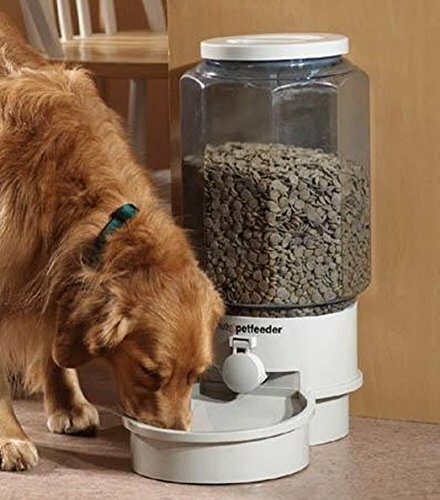 This device is designed to feed your dog at a given time automatically. 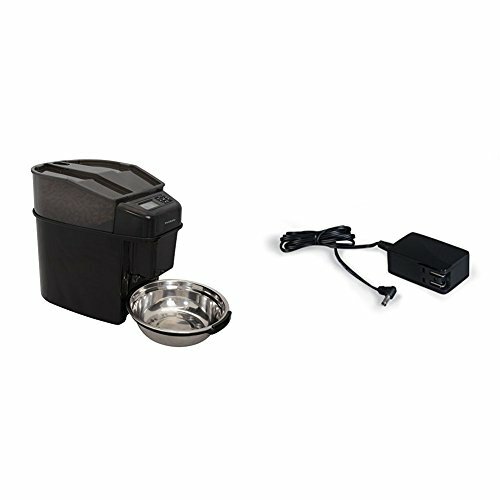 A quality automatic feeding station assures you that your dog can eat even when you’re away. It also helps them to stick to their diet. If you are interested in buying one, allow us to present the top ten best automatic pet feeders engineered to meet your doggie’s needs! The automatic dog feeder from PetSafe can be used in both cats and dogs. Its smart programming allows many ways for you to feed your dog even if you’re not around. Once you install the application, you can feed your dog anytime and anywhere you want. You can set up to 12 meals for your pet. The “Feed Now” option allows you to feed your pet even if it’s not on a schedule. Thanks to its flexible portions, you can divide the meal from 1/8 to four cups, depending on your pet’s needs. Its “Unique Feeding” option allows your pet to have a 15-minute period to avoid puking and bloating. For your peace of mind, once your pet had eaten the meal, you will automatically receive a notification on your smartphone. The unique conveyor design of this device can hold dry to moist foods. Its pet-proof dispenser can withstand your pet’s claws if he happens to be an aggressive eater. 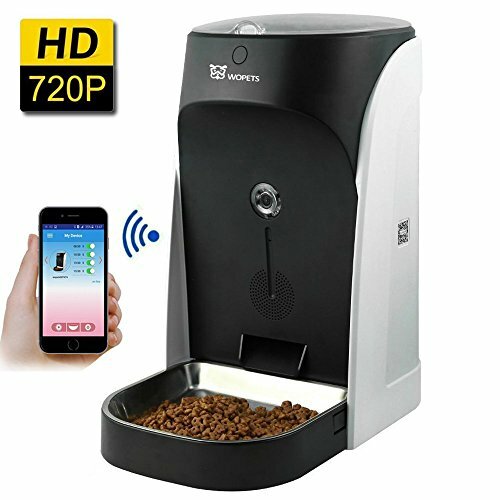 This programmed feeding station will keep your pet full until you arrive home. This model can work as a pet sitter whenever you’re not around. Using its application, you can set feeding schedule for your pet anytime and anywhere you want. Or if you want, you can opt for the manual feeding schedule that this device offers. It features an HD camera for voice and video recording. In that way, you’ll be able to talk and see your dog check how he’s doing after feeding him. This automatic feeding station features two feeding dispensers. You can choose between small or large based on the size of the dog food that you’d like to dispense. The handy feature allows you to dispense from 1 to 39 meal portions, depending on the needs of your dog. The application is compatible with both Android and IOS device. This feeding station can also support up to 32 GB of micro SD card, allowing you to save your favorite moments with your dog. 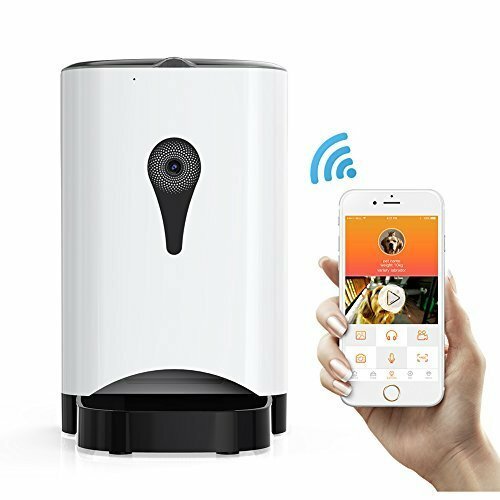 With this smart device, you will never have to worry about leaving your dog home alone in the house. Be confident in leaving your fidos and felines at home thanks to this automatic pet feeder. It features an accurate portion control, approximately 15g per portion and maximum of 20 portions per day. It’s suitable for cats and dogs who need to stay on a strict diet due to a health condition. The built-in 10-second voice recorder and speaker record your voice in calling your pets for mealtime. This pet feeder also offers audio and video functionality, feel free to talk and play with your pets while they are eating. The real-time sharing allows you to share your favorite moments with your cat in social media. This Sailnovo pet feeder is perfect for busy pet parents who need to have a short vacation but can’t take their pets with them. With its 6-liter hopper capacity, rest assured that your pets will have enough something to eat while you’re gone. The Tiovery automatic pet watering system with gravity design is ideal for short stays away from home. It’s easy to assemble and use. In less than 20 seconds, you can let your pets use the product. It is also made of recyclable safe pet materials. Thanks to its compact size, it does not consume much space inside the house. 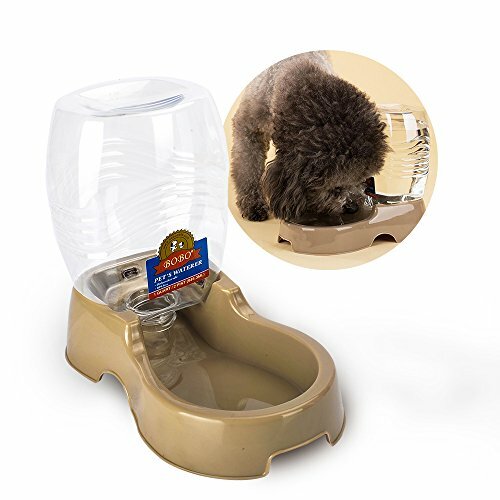 This device is ideal for keeping your pet hydrated, especially if you are planning to leave during summer. This free-falling fresh water allows them to drink anytime they want. There’s no need to use an application or monitor it using your smartphone. The ¼ gallon of water is applicable for small to medium pets. Cats and dogs will not get scared of this device because of its small size. You can fill the food tower with pet food and the bottle with fresh water before you go for your peace of mind. The Ergo Systems automatic pet feeder is built for small to medium-sized dogs. Its compact and pleasing design will suit any modern living room. You can place this device in an area where your dog is most likely to come. The bowl is removable for easy cleaning. Because of the small portion of food that it dispenses, veterinarians recommend this product for pet owners who have diabetic dogs. You don’t need to use your smartphone to set a schedule. This automatic feeder features eight-program settings per day. In that way, your dog will not go hungry if you can’t help staying late in your work. Rest assured that it dispenses food in smaller portions to avoid vomiting and bloating of pets. It doesn’t generate unnecessary noise to scare your dog when it’s mealtime. Check out this new and improved SmartFeeder that features a stronger feeding wheel and better bowl connection. It offers a free SmartFeeder ramp, built for kibbles that need some sliding into the bowl. Using the Petnet application, you can customize the food portion of your pet according to their diet and automate it when you’re away. Once your pet has eaten the food on time, you will receive notifications regarding on the meals served, low food supply, and delivery updates. The best nutrition for your pet is often personalized. This intelligent device will bring food and joy to your pets when you’re not around. The application also helps you to customize a proper meal for your pet to avoid bloating and correct eating disorders. Based on your pet’s age and size, you can now take the guesswork and feed him the right amount of food that he needs. 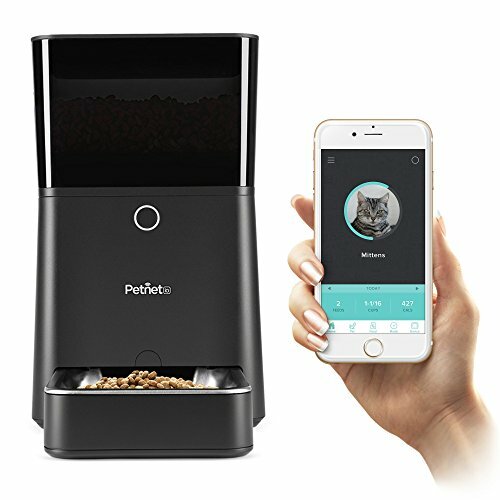 Introducing the Petacc automatic pet feeder that you can control using the Petfun application. Now you can control the set timing feeding and remote feeding to regulate your pets without you around. Thanks to this high-performance device, you can see the feeding data statistics along with a scientific feeding frequency to ensure that your pet has eaten properly. 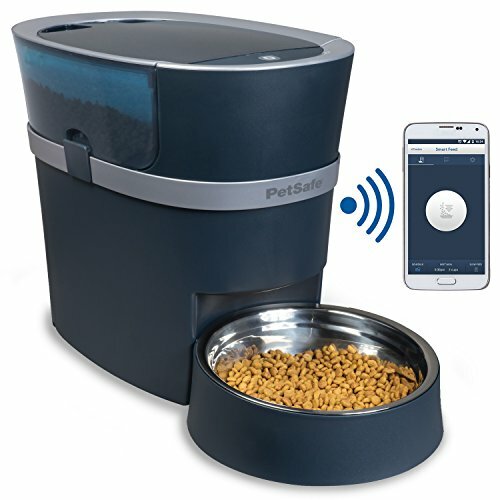 It also features an audio and video function, so you can call your pets for mealtime. This device can be plugged into the wall but in case a blackout occurs, it has a standby battery to continue running. It’s an excellent device for pet parents who are planning to stay out of town. 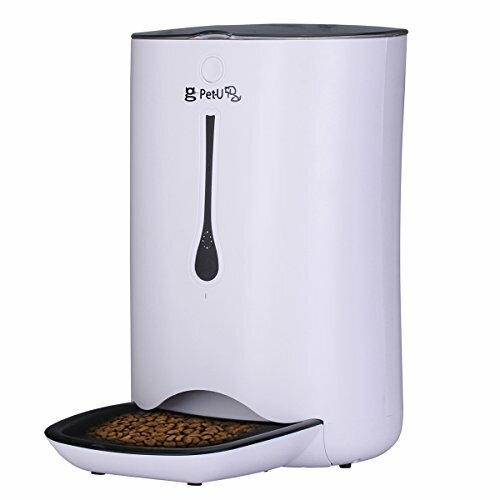 Its multi-function design allows you to take business trips and vacations with peace of mind knowing that your pets are well-fed in the house. Are you dying to have a vacation but can’t leave your pet alone? The Wopet pet feeder can provide the solution to your problem. Thanks to its smart application, you can monitor and set your pet’s feeding schedule using your phone. It is suitable for small to medium-sized dogs. The app offers food portions from one-eighth cup to one cup. If you lose power or the Wifi connection, the battery backup will ensure that your pet is well-fed. 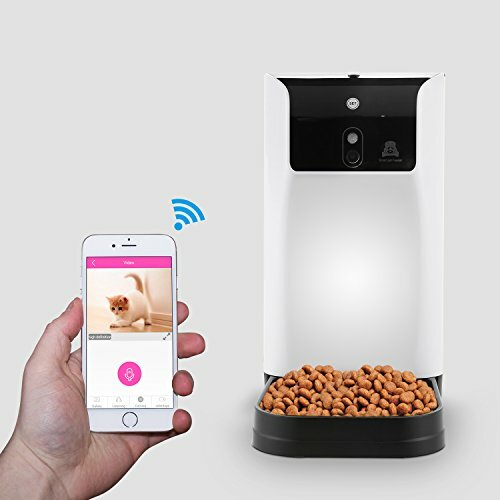 It can serve as both pet feeder and pet monitor camera thanks to its HD camera with two-way audio communication. The night vision capable HD camera allows you to regulate your pets at all time. You can also record a custom greeting and call them for mealtime. It features a stainless bowl that is both stylish and durable. This PetSafe automatic pet feeder features a digital timer that can program up to 12 meals a day. You can choose from 1/8 cup to 4 cups depending on the needs of your dog. It also has an anti-jam conveyor system that can dispense dry and semi-moist food of different shapes and sizes. You don’t need to worry about having stuck food. It can hold up to 24 cups of dry food, perfect for up to two days of feeding your pet. It also features an additional power to make sure your pet remains full if the power goes out. For pet parents who want to correct their pet’s eating behavior, its slow feed mode dispense can help to avoid gulping and vomiting. Its immediate feed mode automatically dispenses the next scheduled meal. The pet-proof dispenser can withstand the prying paws of your pets who’ll try to steal food inside. This sleek and elegant pet feeder from Westlink will ensure that your pets will never go hungry when you’re away. It suits your pet’s dietary and well-being needs. The device can store up to 7 liters of food and serve up to four meals a day. Its smart application control allows you to customize the portion of food that your pet needs. It also has a built-in voice recorder and speaker. You can create a 10-second record to call your pets for mealtime. Thanks to its built-in infrared detection prevent food locking. This is the perfect device for your pets if you are planning to be away for a day or two.